ï¿½ï¿½ï¿½ï¿½ï¿½ï¿½ï¿½Perched where the Caribbean meets the western Atlantic, St. Kitts is an enchanting destination for seafaring visitors from around the world. We have two main marinas for your yachting needs, Port Zante and Christophe Harbour Marina. Port Zante, with its beautiful anchorages, puts you right in the middle of the capital city of Basseterre. It’s just a few minutes’ walk to the historic center and its pastel cottages, the famous Circus clock, and the Ballahoo Restaurant, home of the St. Kitts Yacht Club. Naturally protected and perfectly situated on the island's southeastern peninsula, Christophe Harbour is the Eastern Caribbean's foremost marina. In January, that status will be put on display when it hosts the annual Caribbean Crewfest and welcomes racing crews from the Panerai Transat Classique. 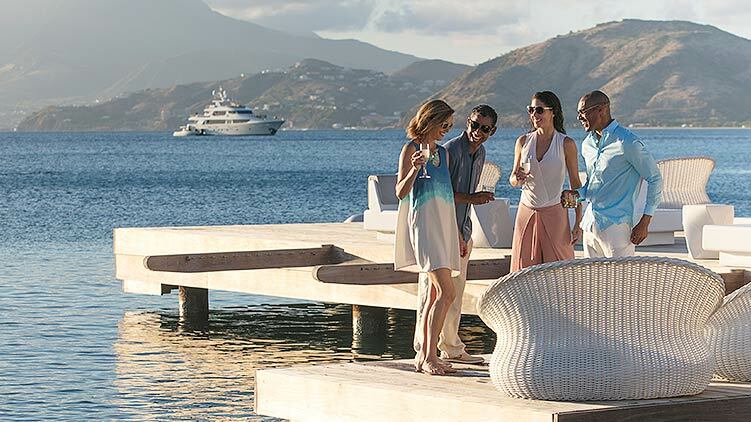 Superyachts and classic sailboats alike will call Christophe Harbour home, and their crews will have full access to workshops, excursions, and all the festivities St. Kitts has to offer. St. Kitts Marine Works near Brimstone offers haul-out facilities, including a 150-ton travel lift that has been widened to 35 feet. Fortress marine and Indigo Yachts provide boatbuilding services, with the latter also offering chandlery services. Whether you sail from our sister island of Nevis, from one of our near neighbors, or from distant shores, we are supremely equipped to help you make the most of your stay, every day.